Here’s a nice interactive example of making data friendly to the average human. What country would you like to live in? 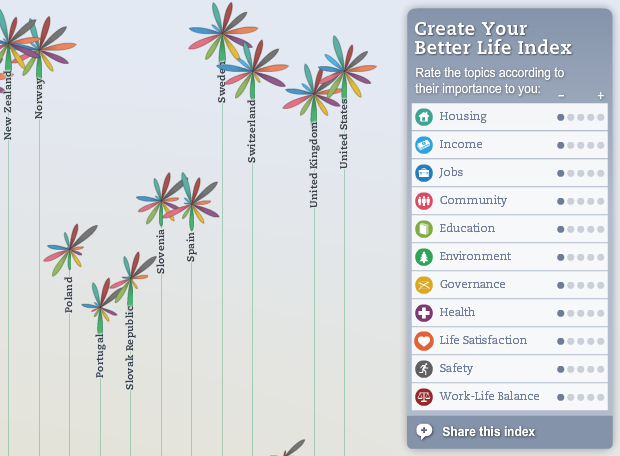 With the OECD Better Life Initiative, you can pick what you care about (Environment, Work-Life Balance, Health, etc.) and see which countries rise above the rest. Another interactive wonder from the brain of Moritz Stefaner. He’s the same designer who created the Notabilia Wikipedia project that I posted about a while back. Looks like it’s time for me to move to Australia. I’m impressed with two things about the World Bank’s approach to data: first, their commitment to openness in sharing data with the world, and second, their devotion to data visualization. They have also done a nice job inviting exploration with the way they have organized their data website. Interesting to see that the mortality rate for children under 5 in the US is about 37% higher than the average of high income OECD countries. And the US spends way more on healthcare than almost any other country in the world. Maybe we’re not spending it on the young. Note: The World Bank is the source of data for the sample I gave a while back using the Google Public Data Explorer.